Pilates exercises help to not only stretch lower back muscles, but they also help to strengthen your abdominal muscles at the same time. Especially Pilates mat exercises like rolling and other forward flexion exercises help to stretch the posterior side of the lower back and spine. This feels good especially if you have pain due to pinched nerves in the lower back. Rolling like a ball as shown to the left, is just that...tuck your knees in to your chest and initiate the roll by pulling your abdominals in to your back keeping your head still. Exhale as you roll gently back into the mat just to your shoulder blades and then inhale as you roll back up to a balanced position. This back stretching exercise is designed to teach you to stretch and articulate your spine from the cervical spine at the head and neck to the lumbar or low back with a stable pelvis. Notice as you stretch lower back muscles you will resemble a large “C” shape from the top of your head to your tailbone. Starting Position: Sit with your legs extended or slightly bent in front of you, hip-width apart. Be sure your spine is straight, and stretch your arms out in front of you. Action: Inhale as you lift up out of your hips. Exhale as you roll your spine forward, scooping out your abdominal muscles like you are reaching over a big beach ball. Inhale to hold the stretch. Exhale as you roll your spine back up, stacking it up over your stable hips. Notes: Keep your buttocks anchored to the mat and feel the stretching and flexion in your spine as you deeply pull your belly button back into the spine. Caution: If you have osteoporosis, avoid any deep flexion (forward bending) exercises such as this one. You can modify this low back stretch by hinging forward at the waist so the spine stays extended and you feel more stretch in your hamstrings. Find out more ways to stretch your lower back along with over 50 Pilates mat exercises pictures and detailed descriptions in my new Pilates Ebook. This one should feel good for those with spinal stenosis. Sitting tall in a chair stretch lower back muscles by exhaling as you roll your spine forward and down to the floor. Then, as you inhale, peel your spine back up over your hips until you are sitting tall again. Notes: Really activate your abdominal muscles by pulling them up and in as you roll down and then back up again, stacking your vertebra one by one as you come up. 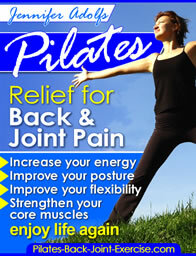 Leave my stretch lower back muscles and find out more ways Pilates can benefit you.